If you wait for feelings to come to do something, it will not happen. If it does happen and its a reoccurring event, you will loose momentum - when based on feelings alone. Sometimes you just don't feel like doing things. Waking up at 5 am to go work out, or waking up early period - its hard to remain consistent, to keep the momentum going even. When you've been at it for over five months, and you forget the reason and cause that got you to start in the first place. I've recently recommitted to going to the gym (in January and still going as of this post going out). I also have a few health goals. I come from a family that has had plenty of medical issues and I want to ensure that I've taken care of myself the best way possible. I have countless accountability partners checking in with me and that has helped along the way. Here's the catch though: If you wait until this feeling comes, there is a great chance that you will not go through with the action. There are times when motivation comes full throttle and excitement accompanies it. You'll have a slow building momentum and eventually fall off. Feelings don't last long. 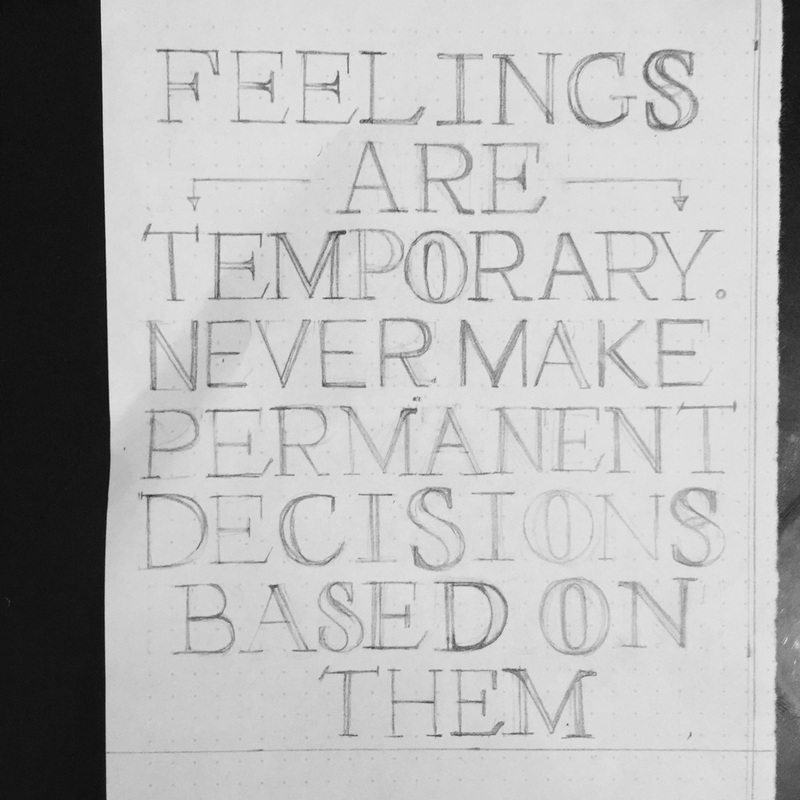 Emotions are temporary. I can attest to this because I went to bed two days in a row thinking that I would go to the gym early in the morning to get my workouts in. When 4:50 came rolling around, I didn't feel like getting up. Action will over rule feeling when you need to get things done. Shake off the lazy tail and like Nike Just Do It! I am still very much guilty of not getting to the gym at 5 am, however I have decided to go in the evenings after work. I must admit that It's much easier for me to go with someone than on my own. I've been going faithfully for the past three days. I know that regardless of how I feel as I continue to keep going I can see results. Remember, Actions yield results. 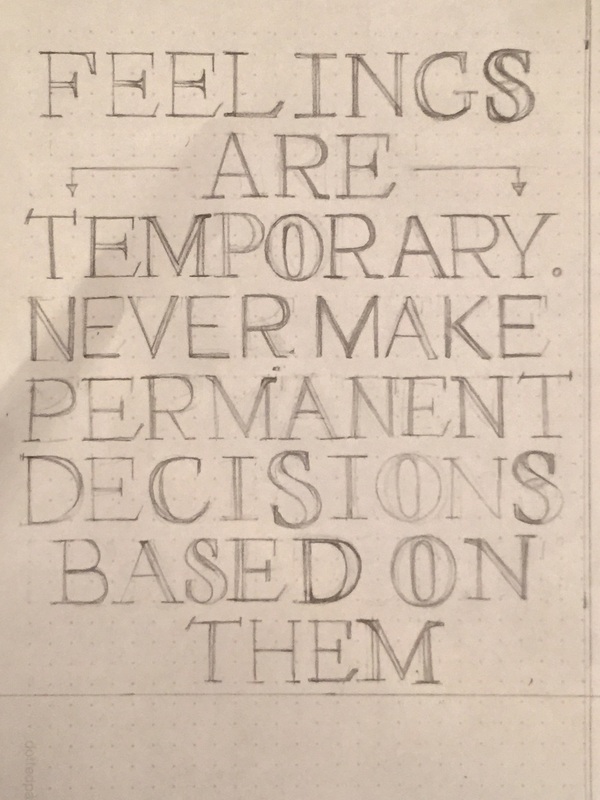 When it comes time to practice hand lettering - which I have on my schedule, in my calendar and always carry my tools with me - I make it a point for it to not be something I am doing based on how I am feeling. How will I continue to grow and explore with this experiment if I don't put the effort beyond what I am feeling? Just like in health and wellness, it takes time to see the results you wish to see from deliberate practice in lettering. I have a question for you! What did you feel like doing and end up avoiding when you realized how much more energy it would take? Email me so we can chat!